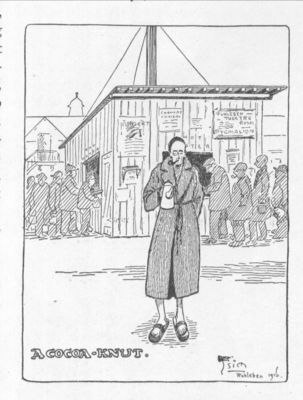 This drawing shows an internee, clad in bathrobe and sandals, holding a pot of hot cocoa in the prison camp compound at Ruhleben. Incarceration oftehn encouraged the development of interesting characters inside prison camps. Behind him is a long line of prisoners, waiting to receive hot water from the camp canteen. There were two large boilers inside the building, which provided the prisoners with hot water to make tea or cocoa.